Recently, in search of some special new restaurants to try, I came across a jazzy review by the Washington Post's Tom Sietsema of Masseria. 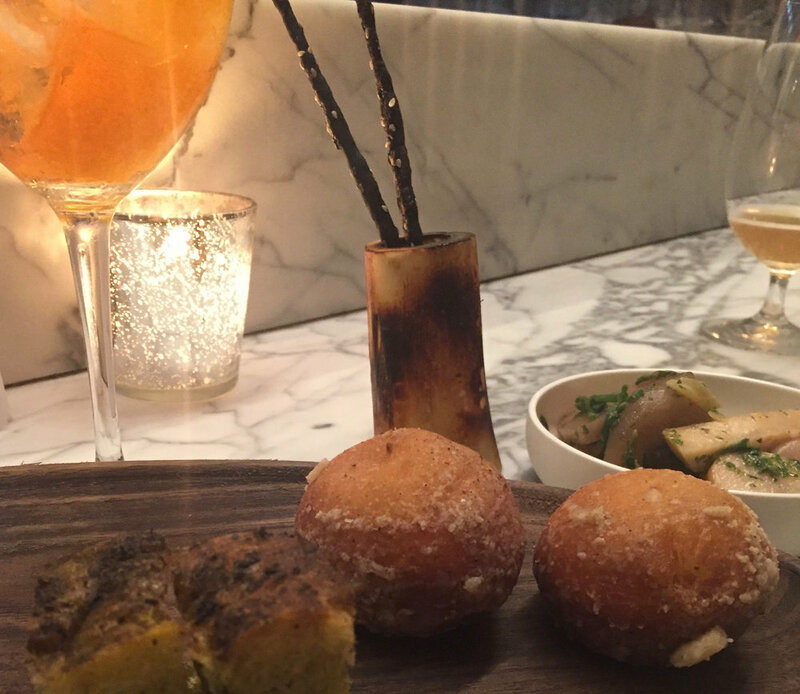 Written in the spring of 2016 and then seconded last October, Sietsema claimed that Masseria, which opened in August of 2015, was "one of the most alluring restaurants in the city," a rich experience in which "the food lives up to its looks." Twice has Masseria, by chef Nicholas Stefanelli (previously at Bibiana on New York Ave NW), placed on Sietsema's Top Ten lists, and a March 2017 article on the Huffington Post was positively orgasmic. The restaurant has also earned a Michelin star. 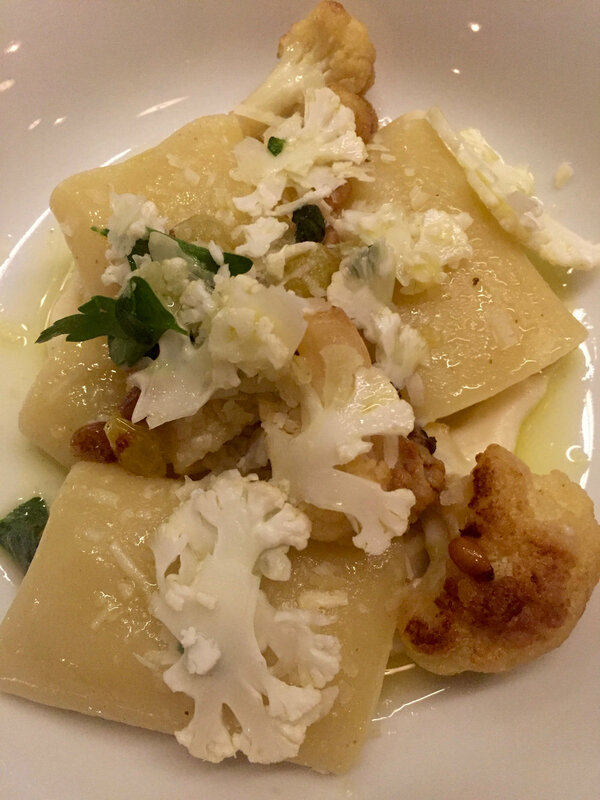 With all the enthusiasm surrounding this hot-spot testament to Stefanelli's Puglian heritage -"a temple to those pilgrims in search of the city’s best food" for pete's sakes- I was thrilled to score a reservation at the chef's counter. It would be the perfect place to celebrate my and Tom's 13th wedding anniversary. Last night, after an interminable 45-minute Lyft ride down, down, down to 4th St NE, just around the corner from hip Union Market, during which I learned more about Uber vs Lyft and Bitcoin that I ever imagined, I finally, and only by calling Tom in desperation, found Masseria. It hides in an industrial park behind a nondescript wall, its name rendered in a small, subtle script that was hard to see on a drizzly, dim evening. I toddled in on cute heels that I rarely get to wear, excited for a midweek night out of the house. Masseria's interior is welcoming, cozy, and chic in a thoughtfully eclectic way. Everyone is friendly, pendant and overhead lights are perfectly set so that you're neither in a fitting room nor in dire need of a flashlight to read the menu, and the open kitchen and sizeable bar whet your appetites for food, drink, and conviviality. Tom and I were seated on the middle stools of the six-top chef's counter. He started with a dry-hopped saison from Italy's Lombardy region. I was glad he enjoyed it so much because at $15 for a standard bottle, it seriously tipped the scale. I opted for the "punch on tap," an Aperol Spritz made with sauvignon blanc and lime. Unfortunately, it was the first of many average things I was to have over the next three hours. We both chose to splurge on the 5-course tasting menu, and because I wasn't driving home, I opted for the wine pairing too. As memories of the ardent reviews danced through my mind, I savored one of our caciocavallo-stuffed bomboloni, shrugged my nose at the tomato fondue that was too reminiscent of canned tomato paste, returned the squid ink and sesame seed breadstick to its osso buco bone home, snapped up a few pickled veggies, and perused the menu. I chose quickly, deciding to start with the vignarola, a plate of gently prepared artichoke hearts, ramps, fava beans, english peas (both whole and in puree), wilted escarole, and mint. I could not locate the mint, and the dish would have benefited by a dusting of finishing salt, but it was a lovely presentation that allowed the vegetables' flavors to shine. Tom kicked things off with a bowl of the king crab and lobster mezzaluna pasta nestled in a tomato sauce that lacked that off-putting tinny acidity so many tomato sauces suffer from. I don't tend to love seafood and tomatoes together, but as far as frutti di mare goes, this one was solid albeit not memorable. Next out came a bowl of paccheri (one of my favorite pastas) with cauliflower, golden raisins, pine nuts, oregano, and pecorino for me, and a dish of fleshy orecchiette with rabbit ragu, and parmigiano for Tom. Having made homemade orecchiette myself, I was impressed with the size of these but even more so by the lightness they maintained despite apparent heft. Tom loves rabbit ragu and enjoyed this version; I was less jazzed. My paccheri was lovely but slightly too al dente and again I felt salt would have brightened the lot. So many great Italian cooks, both home and professional ones, have such correctly generous hands with added salt, so I was surprised by how often I found myself wishing I'd brought my travel tin of Maldon or that someone, anyone, would offer me some. The sous chef at the meat station, based at our one o'clock, looked like Putin's nephew but nicer and boy did he love salt. Too bad he didn't season the whole kitchen. As I headed into my second bowl of pasta, this one the chick pea casoncelli with artichoke, olive oil, and mint, Tom moved to fish, the Mediterranean stone bass, with fennel, cherry tomatoes, cucumber, and basil. As ambivalently as I ate my previous dishes, I truly enjoyed the casoncelli. They were like delicate boats full of various textures and flavors. Meanwhile, Tom meandered through his fish which he thought was ok but which I found shockingly, distastefully fishy. What, pray tell, is worse than fishy fish? I was, at this point, becoming exceedingly full, but I'd chosen to close dinner out with the bue, a 30-day dry-aged beef ribeye with cheese fonduta, olive oil, crushed potatoes, and wild spring onions. Tom awaited the piccione al mattone with rhubarb, duck fat pastry, english peas, and lavender. Putin's nephew was in charge of both, and we'd been watching him flatten squab between two pans and brown filets of beef in absurd mounds of butter all night. I had high hopes. He and the sous chef next to him, a stoic, lovely man who managed vegetables, had a great rapport, managing printed orders with a shared Sharpie and few words. I love watching kitchen folks, but that is a tribute for another post, and will be. Out came my beef which was, sadly, not at all what early plates of it looked like. This one was slightly cold, the browned exterior an illusion that didn't hold up; it was a limp round sitting next to limp mashed potatoes and surrounded by unsightly drizzles of cheese sauce and some sort of brown liquid. I enjoyed the grilled onions the most. I did not like the Super Tuscan paired with the course but did like the white pairings with my vignarola and pastas. Tom's squab was fine. The duck fat pastry was exceptionally flaky but T has come to realize that he prefers rhubarb in sweet versus savory form. That foot leaves something to be desired. On to dessert. I had a cheese plate, and Tom had the baked chocolate mousse with dulce de leche, mascarpone cream, and tiramisu gelato. The cheeses were inaccurately described as "briny, briny, mortadella," an error I was grateful for because really, I love pungent stink, but mortadella?? The wine pairing with my cheese was a cider than can only be described as kombucha. No thank you. On the flip side, our chocolate dessert was a showstopper. Mamma mia was each bite a wonder. I could easily have eaten another. All in all, this was a stunningly expensive, stunningly average meal. The service was great, the restaurant is appealing, but I didn't taste any magic last night. And that's a shame on many fronts.